Recent downgrades of European government and bank debt have fuelled the discussion on the establishment of a new European rating agency. This will bring no relief, as long as Euro politicians will be eager to exert influence in such a new entity, can be concluded after their accusations that S&P's move on January 13 was politically motivated. Undisclosed rating processes on a 10-step ladder from AAA to D, salted with '+' and '-' signs, facilitate criticism about an opaque procedure that ultimately costs public borrowers billions in additional future interest rate payments. Setting up another ratings agency along the same conflict-laden model will be futile as long as this economic down cycle is with us on a global scale. The strongly growing chaos in the Eurozone cannot be upheld by a new entity that follows old guidelines as this has shown the lack of effective transparency, efficiency and neutrality in an outdated system. After Wikipedia and Wikileaks shone light on science, history and politics, Wikirating may bring open source financial transparency to the web. Attempting to iron out structural problems of traditional rating procedures, Wikirating is open source, fully transparent and retrieves its results from participants input. 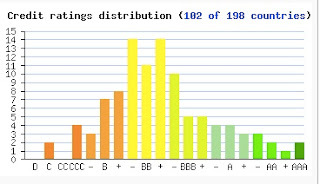 Initiated by Austrian mathematics Dorian Credé and and finance whiz Erwan Salembier, ratings are derived from weighted user input. They stress to point out that their model will improve with rising user input who also have a say in improving the formulae used. Wikirating's methodology can be found online. The Sovereign Wikirating Index (SWI) is a very simple process and includes economic indicator plus indices on human development, corruption perceptions and political (in)stability. SWI ratings tend to underscore the ratings of Fitch, Moody's and S&P and align more to Chinese Dagong agency. Find a comparison table of the SWI and the other agencies here. Political Instability Index (20% weight). Based on data and user input since October 2011, sovereign ratings at Wikirating tend to be slightly lower than at the other agencies. This proves the widespread criticism that conventional ratings are downgraded too slow. It is obvious since the onset of the crisis in 2007 with the implosion of subprime market that these ratings were not reliable and that rating methods needs to be drastically improved and controlled. The exaggerated power and influence of the credit rating industry has strongly motivated the idea of Wikirating. The analyses on credit worthiness of countries and governments issued by the rating industry have been too long over rated, and whereas governments are trying to regulate the rating and assessments activities, Wikirating offers a platform where anyone can contribute for better, open and more transparent credit risk assessment. A country list shows far fewer AAA ratings and sees most major nations one or two notches below their established ratings. 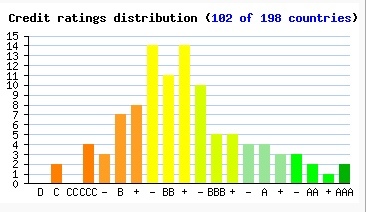 This is well reflected in this graph of rating distribution based on 102 countries. Only 2 countries retain their AAA rating with Wikirating, Hongkong and Luxembourg. 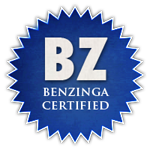 Find a complete table of rating comparisons with the other agencies here. I recommend to surf their website that lists more information on such delicate issues like user influence and also provides links to become a member.